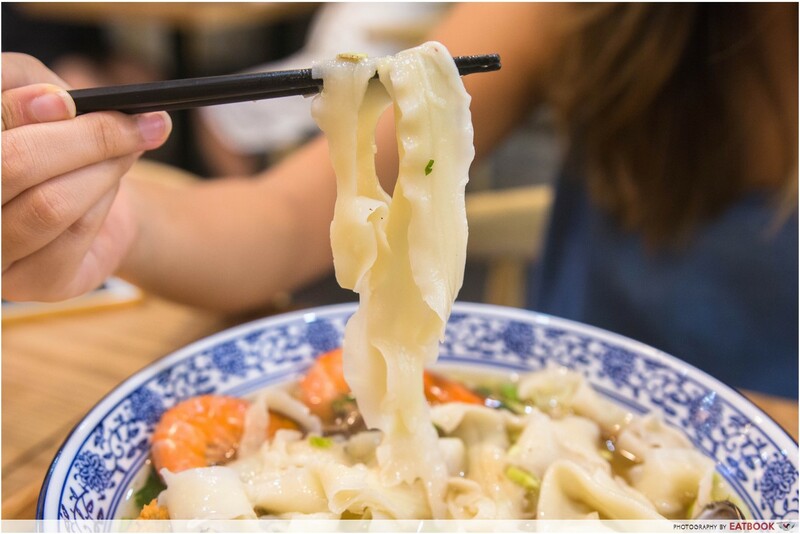 Update: Nuodle is now halal-certified and there’s a new outlet at NorthPoint City (#01-175). Located just a short bus ride away from our office, the opening of SingPost Centre is pretty much one of the best things that happened to me this year. If you haven’t heard, that is where Gong Cha is making their comeback. But that is not the only thing that the new mall offers. 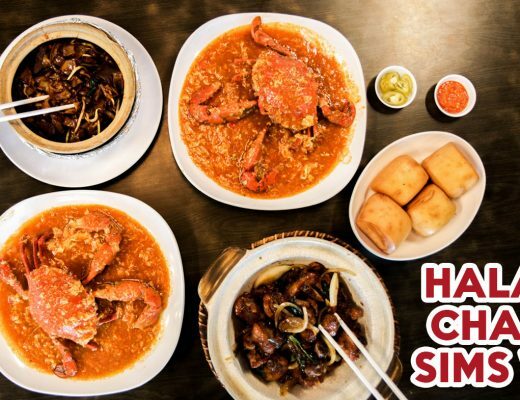 From UPOT to Hawkerman, Singpost Centre houses many popular food names and one of the many restaurants that caught my attention was Nuodle. 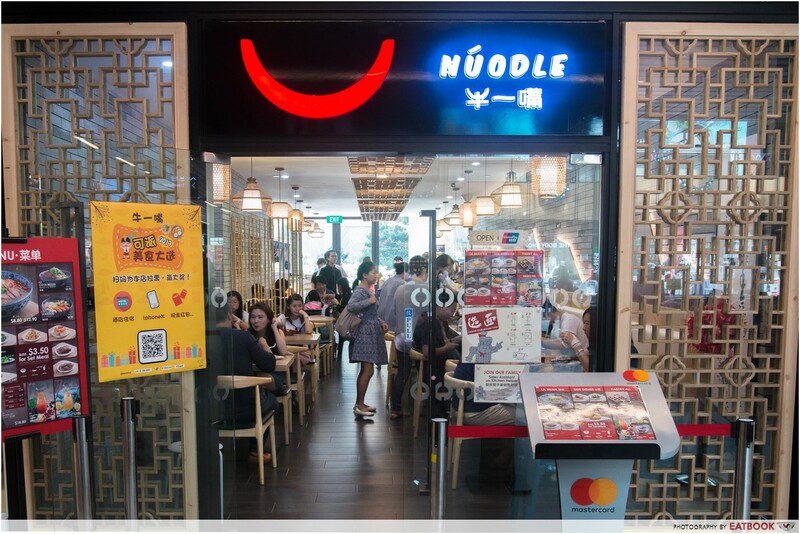 I admit I have never heard of Nuodle but when I saw a video of the crazy queue that formed outside their restaurant, I went to try their food without thinking twice. 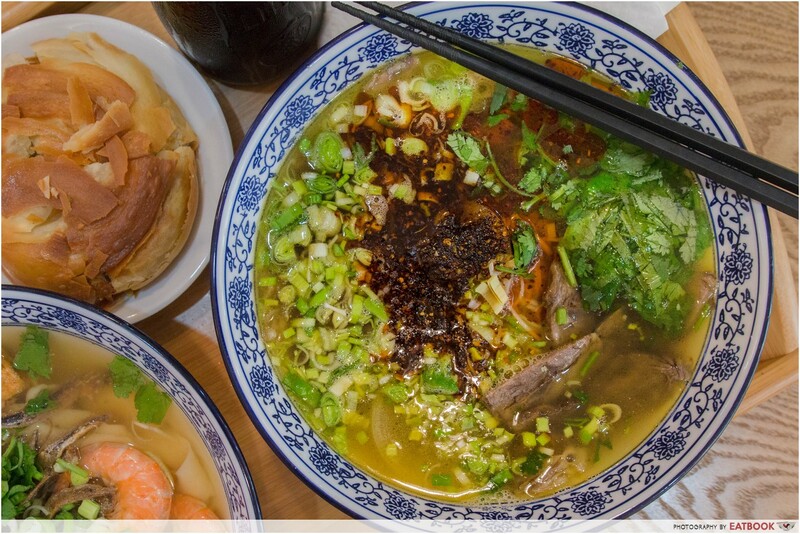 At Nuodle, the restaurant serves only three noodle dishes – Signature Beef La Mian ($8.80), Seafood La Mian ($8.80), and Cool Mixed La Mian ($9.90). 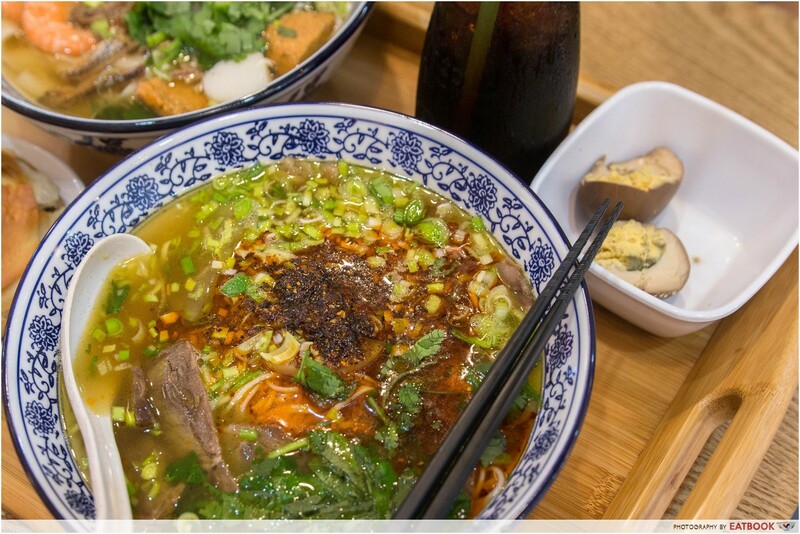 The first bowl that we had was, of course, their Signature Beef La Mian. For an additional $3.50, we also opted for the set meal which came with a side dish and drink. 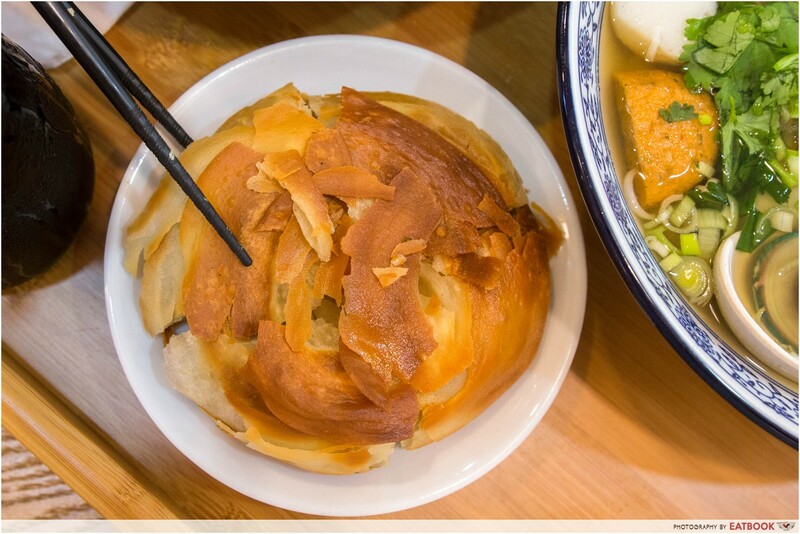 We had Braised Egg and Sour Plum Drink but you can choose to go for other side dishes such as Pickled Cabbage and Potato Salad. After about a five-minute wait, the noodles were ready. 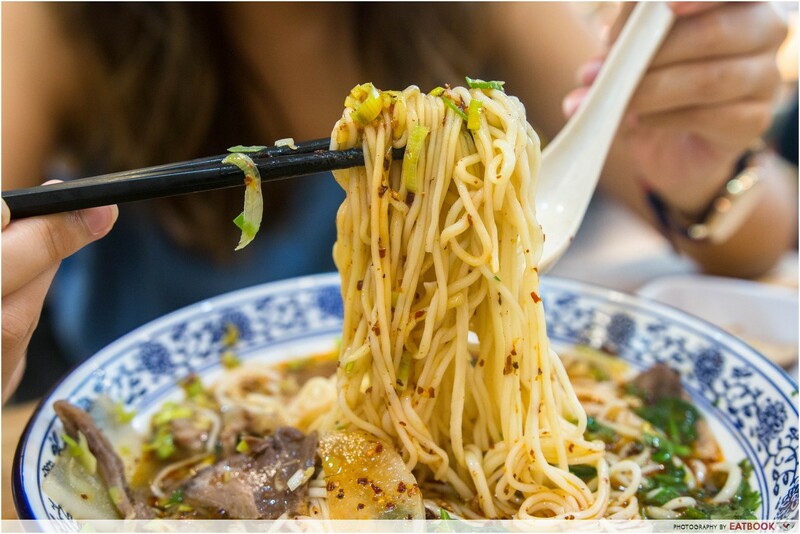 Unlike the picture shown in their menu, the beef la mian was a messy heap of noodles, beef slices, radish, combined with generous amounts of scallions and chilli oil doused on top. However, as messy as it was, the huge portion of noodles and ingredients was what mattered most to me. The relatively light soup came with a thin layer of oil on top but was not overwhelmingly greasy. Though the soup was light in colour, it was well-flavoured with a strong taste of beef stock and after the first spoonful, my colleague and I simply nodded to each other and reached for a second helping. After mixing the chilli oil into the soup, it added an exciting punch which kicked in at the back of my throat. Though I have never been good with spicy food, the chilli oil in this was bearable and I actually liked how it enhanced the overall taste of the dish. As for the noodles, we got to decide the type of noodles we wanted – thin, normal, thick, flat, or leek leaves. Initially excited over what we thought was noodles made of leeks, we later found out that it was la mian that is pulled to the shape of leek leaves. Wanting to play it safe, we went for the normal one. Though the noodles were thinner than what I had expected, it was still enjoyably tasty and had a good bite to it. The highlight of the noodles was the way they were both springy and soft at the same time. Like a mixture between ramen and mee sua, I could easily snap the noodles with my chopsticks but they still had a chewy texture when I bit into them. On to the star of the bowl, the beef slices also earned my stamp of approval. On its own, the beef slices were lightly marinated but I liked it that way as I could taste the natural flavour of the meat. Though each beef slice was thin and generally lean, they were laced with small amounts of fats and soft bones, which gave a great variety of textures to it. 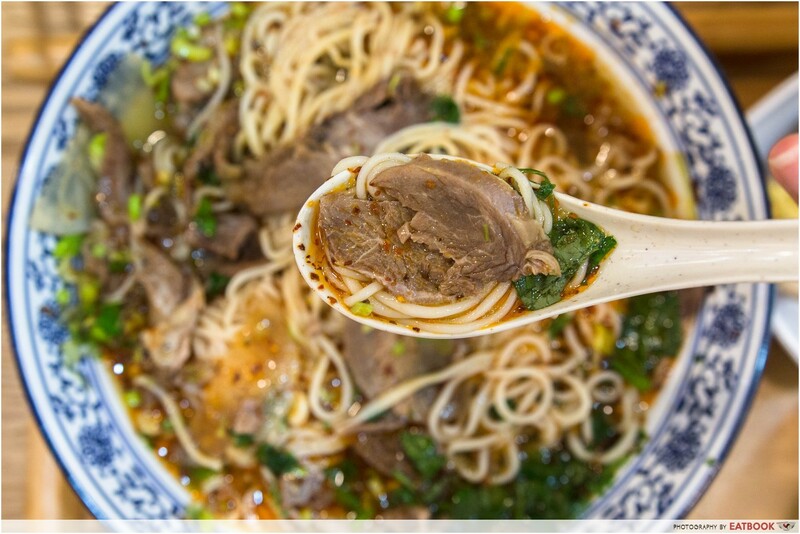 Overall, both the noodles and beef absorbed the soup well and every spoonful was delicious. For $8.80, both the taste and portion impressed me and I understood why a simple dish like that attracted such long queues. Enough said about the beef la mian. For the second dish, we tried their Seafood La Mian. 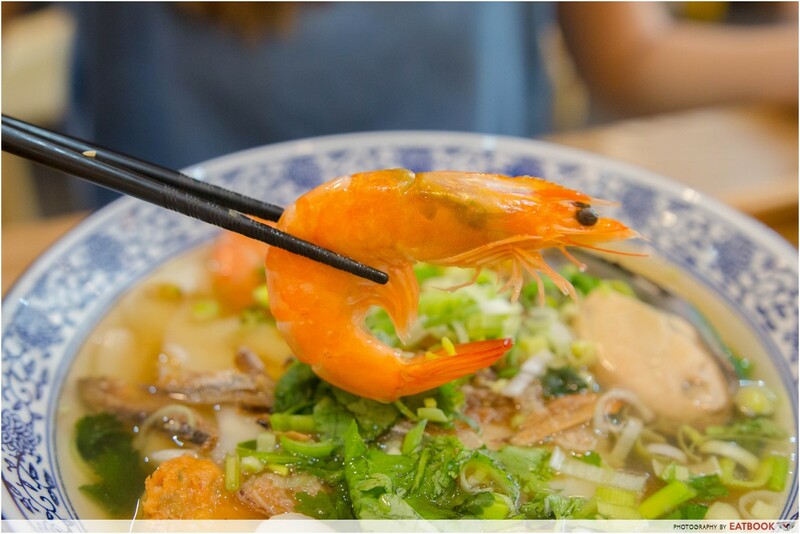 Compared to the beef la mian soup, the seafood one was lighter in both taste and colour, but not any less flavourful. The soup reminded me of the fish soup bowls we get in coffee shops, but without the aftertastes that come from MSG. Overall, it was clean-tasting with a pleasant seafood flavour. For the noodles, we decided to try their flat ones. With wavy sides, the flat noodles reminded me of both knife cut noodles and mee hoon kueh and I expected them to be doughy and chewy. However, I was taken aback when I first tried the noodles. Besides being smooth and soft, another thing that stood out to me was how well-seasoned the noodles were on their own. 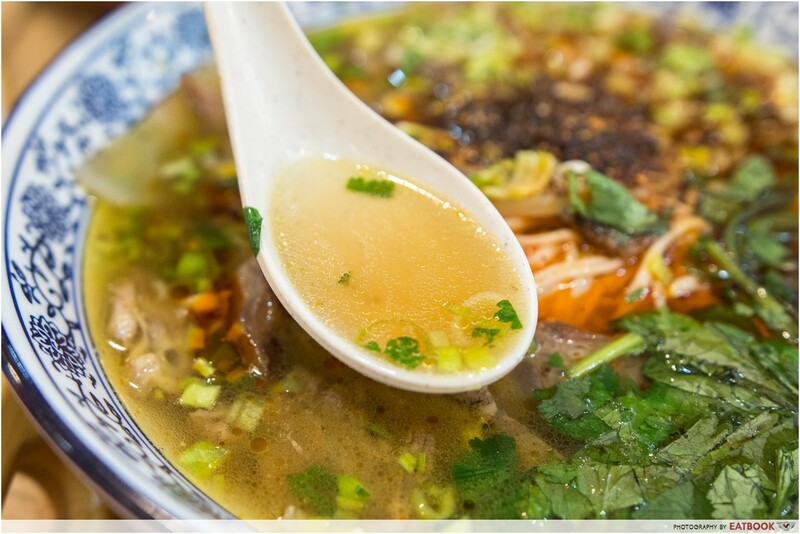 Though the first few bites were enjoyable, the saltiness of the soup and noodles got a little overwhelming after a while. 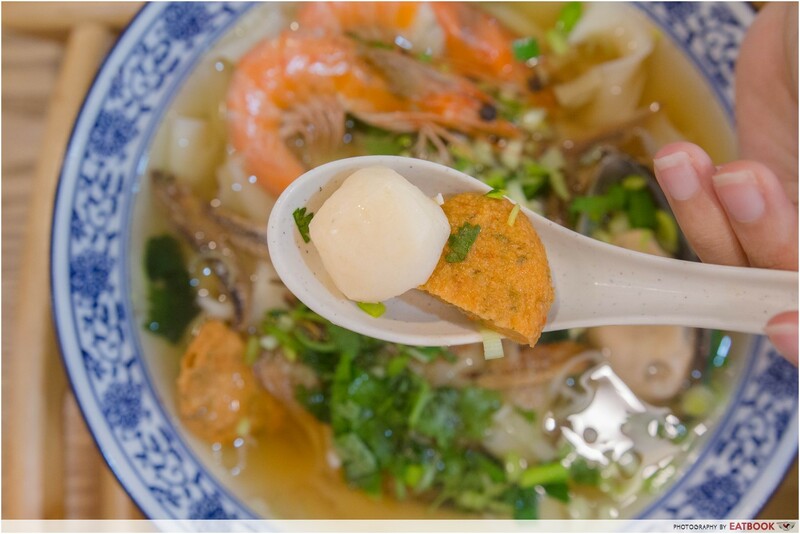 As for the other ingredients, the seafood la mian came with two prawns, a huge mussel, a fishball, and a fishcake. Both the prawns and mussels were fresh, chewy, and slightly sweet. 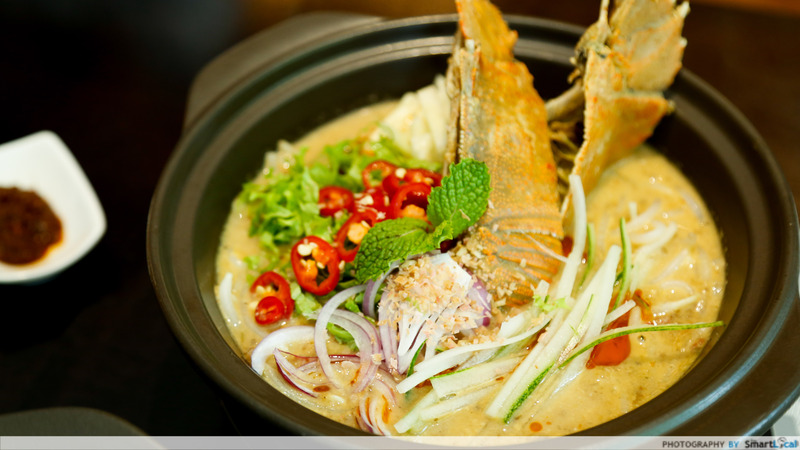 With the noodles and soup so packed with umami flavour, the seafood gave a pleasant change to the palate. When it came to the fishcake, I wasn’t expecting much but it turned out to be one of the most head-turning ingredients. Soft and sweet, the fragrance of lemongrass was also strong in it. There were also some vegetable bits that added a crunch to the fishcake. Even though the two huge bowls of noodles were more than enough to satisfy us two, we could not bring ourselves to leave without trying their Beef Pancake ($3.90). 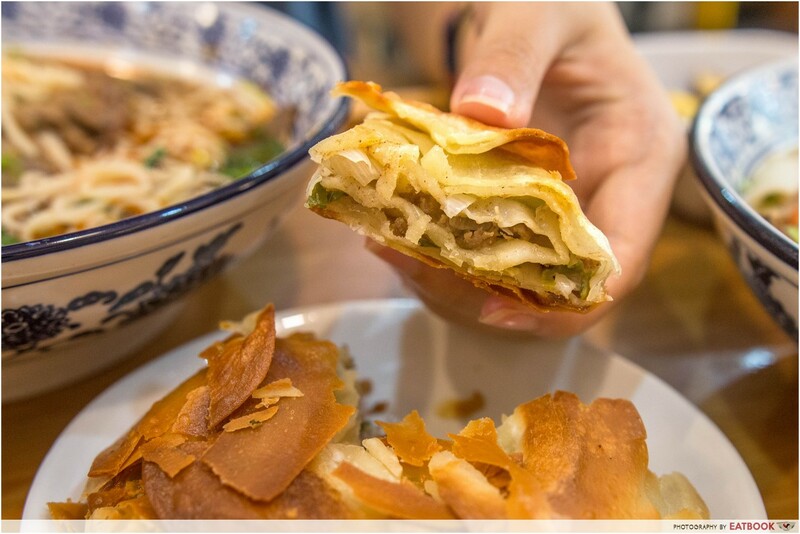 Served as a side dish, the beef pancake was a thick and crispy pastry that was stuffed with minced beef and chopped leek leaves. Already cut into quarters when served, the flaky pancake was easy to eat, and the layers of crust stayed together firmly. In comparison to how well the two main dishes fared, the beef pancake was pretty disappointing. For such a thick pancake, the amount of minced meat was too little for its taste to be noticeable. Though I liked that the pancake was crispy and at the same time not too greasy, there was hardly any flavour to it. For the parts where there were meat, they were inconsistently done as well as some parts were juicy while others dry and tasteless. Having read about how insane the queue at Nuodle can get, we arrived at the restaurant five minutes before their opening time, determined to beat the queue. When we got there, the store was already half-full, although the sign on their door still read “closed”. We found out later that they welcome customers into the store before their opening hours but start taking orders only at 11am. 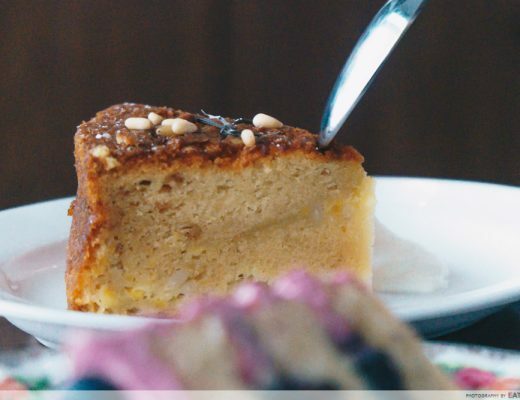 At Nuodle, they work entirely on a self-serviced system. At their counter that is located at the back of the store, we made our orders and payment. A buzzer was then given to us which we exchanged for the food at the collection counter later. 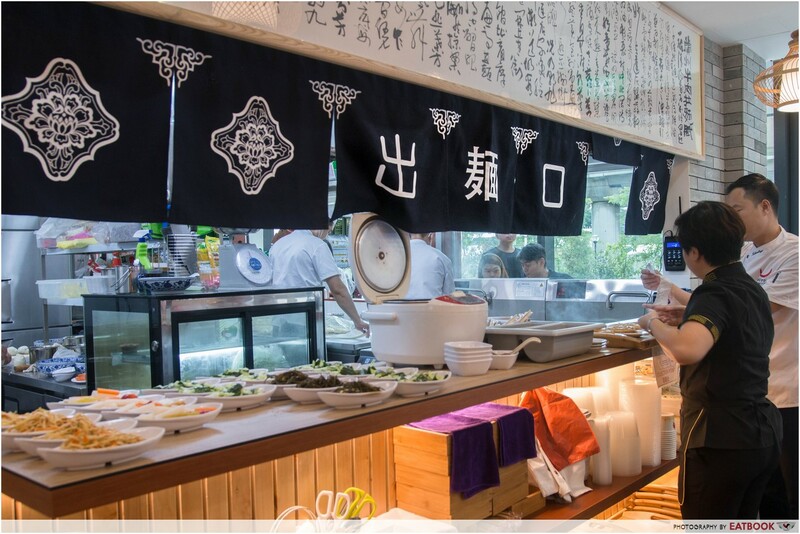 Even though the restaurant filled up quickly, the servers were efficient at taking orders, preparing the food, and clearing the tables for the next customers. 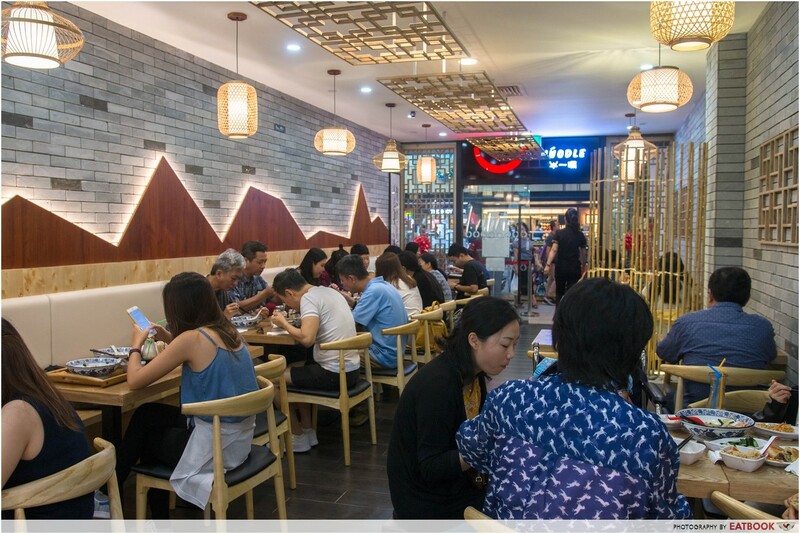 Overall, the brightly lit and minimally decorated restaurant had a casual and comfortable setting that is great for those looking for a quick and delicious meal! In terms of quality, quantity, and value for money, Nuodle checks all three boxes for me. Even though the beef pancake did not taste as good as I had expected, both the beef la mian and seafood la mian impressed me enough to make me want to return. 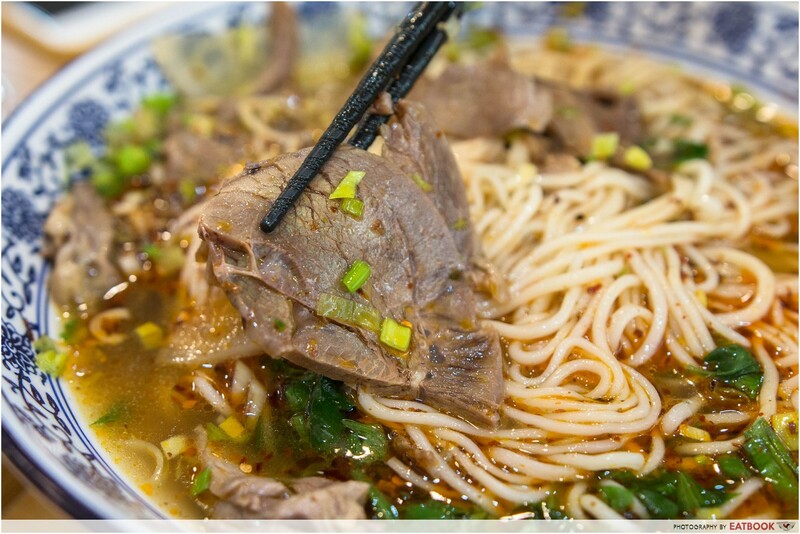 Lovers of beef noodles would know that eateries specialising in this dish are hard to come by and this is one place that you should not miss out on! 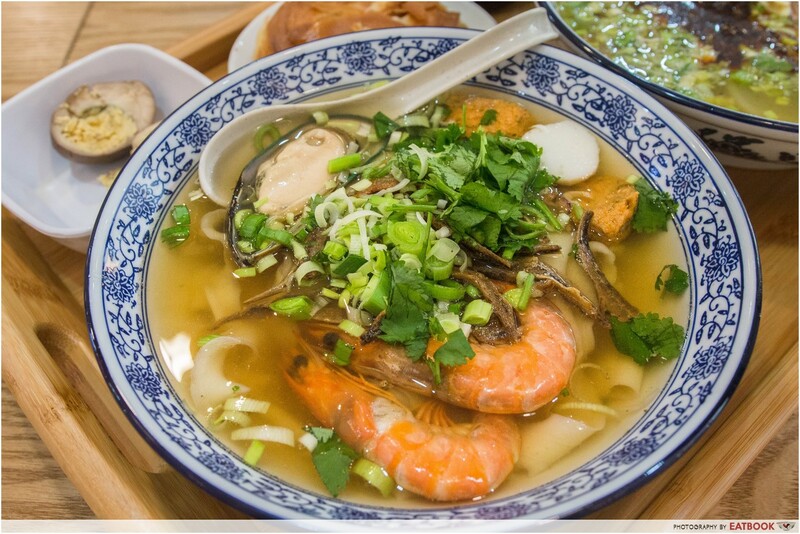 For more comforting noodle soup, check out Mrs Pho or Pho Stop! If you’re in the area, pop by 5 Little Bears for some Taiwanese snacks as well. Nuodle is a halal-certified restaurant.